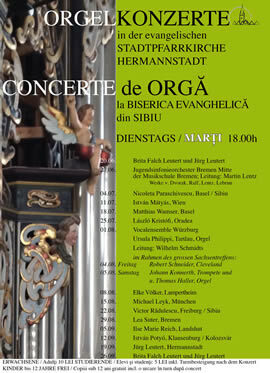 Between June and September, Evangelical Church is hosting every Tuesday, from 18:00 o’clock an organ concert. The ticket price is 10 Lei and it includes a visit to the tower of church after the concert. “Music Reform” with: Jugendsinfonieorchester Bremen Mitte der Musikschule Bremen; Leitung: Martin Lentz Werke v. Dvorak, Raff, Lentz, Lebrun.